Want to leave the hustle and the bustle of downtown Vienna? Then why not go to heaven?! Just a short car or underground/bus ride from downtown will take you to “Am Himmel” with its forests, vineyards and green (or white) meadows on the slopes of the hills, the city lying below your feet. If you come by public transport, after switching from underground station Heiligenstadt to the bus, you should stop at the impressive Karl Marx Hof, which was built in the ’20s. The longest connected building of the world is a “Gemeindebau”, some kind of government housing – a very typical and special thing in Vienna. 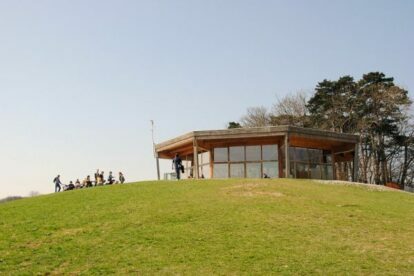 Once you have arrived at the top of the hill, you will notice the octagon-shaped building. That’s the café restaurant oktogon “Am Himmel”. Either you take a rest and a hot or cold drink before a walk – or you reward yourself with a piece of cake after some exercise. The café itself is a very nice place with its huge windows from top to bottom and they do good cakes and warm dishes. You have a grand view over the city while having a breakfast or a delicious cake.